A thousand sheets of paper: Pink and Main's 5th Birthday Blog Hop! 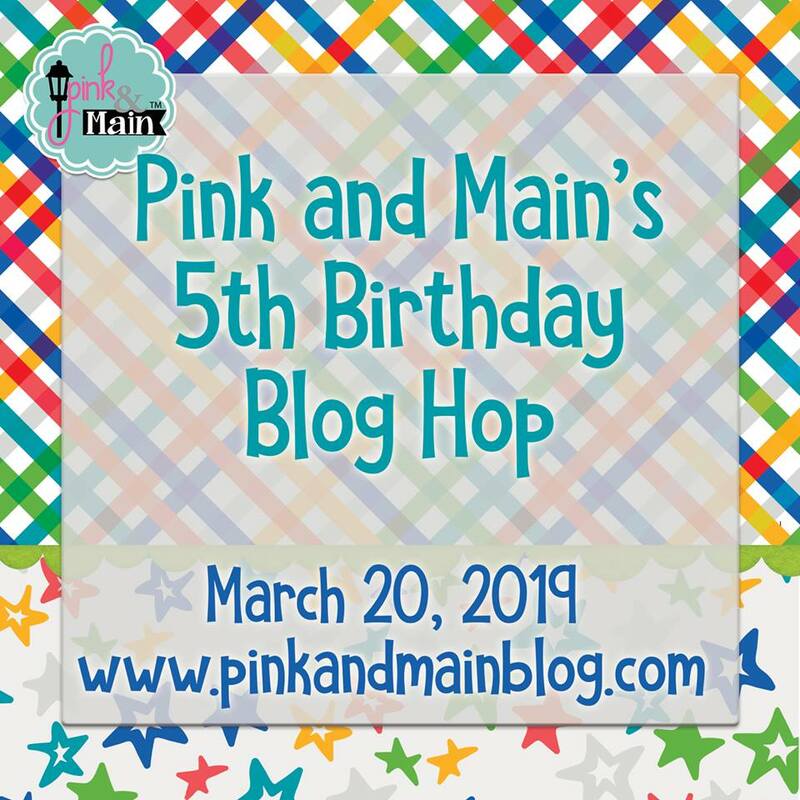 Pink and Main's 5th Birthday Blog Hop! 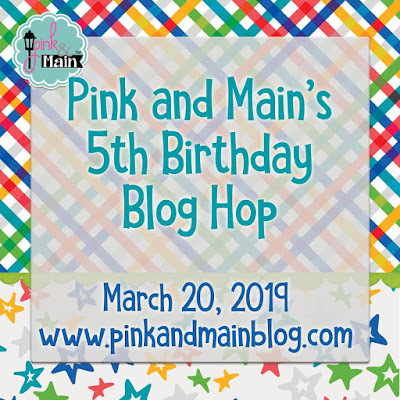 I'm super excited to be celebrating Pink and Main's 5th Birthday as one of their guest bloggers for the big celebratory blog hop today! Five years of cute stamps and fun dies is quite the accomplishment and we think that is something worth throwing a party for! And what's a party without some gifts? Well five lucky Pink and Main friends who leave some love on every stop in the hop will each win a $50 gift certificate to the store. Now that is totally worth making the time to oooh and awww over all the amazing cards that have been made by my fellow crafters using the brand new March release! There is a whole lot of inspiration to be found in this hop and you've got until the 24th to complete it, then the winners will be announced on the Pink and Main blog March 25h. I decided to make a fun shaker card with the new Bee-Day stamp set for the hop today. Aren't they just as cute as can bee? LOL! 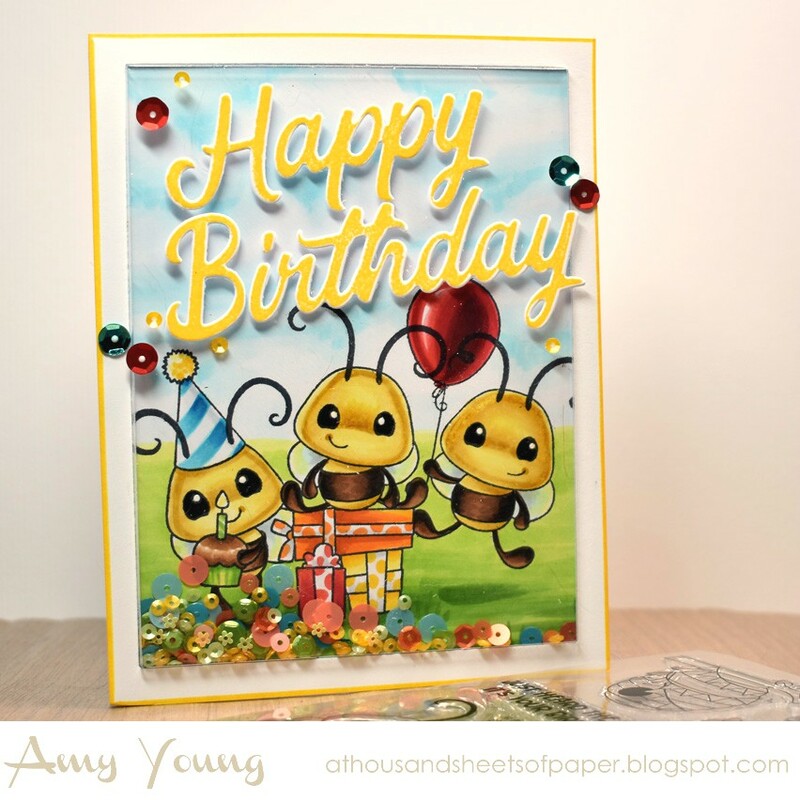 I stamped and masked all three of the darling bees on the bottom half of my card leaving plenty of room for the large Birthday Script sentiment up above. I love the coordinating Happy Birthday die that works with the stamp set creating a pretty outline effect on each of the letters. All together they make for a very cheery and playful birthday card. Alrighty, so to keep this party moving the next stop on the hop is Dana at Got Joy Creations. If you get lost on the hop you can always refer back to the Pink and Main blog for the master list. Happy Birthday Pink and Main! I love your card! Looks like a fun party! Super cute! Your coloring and shading is fantastic! These little bees are so cute and then to make them into a shaker....just awesome ! What a 🐝 bee-utiful shaker card! I love all the detail and how sunny your card is! I love what you did here! And these are such great products! Thanks for the post! OMG, talk about great minds thinking alike! LOL! Love this adorable card! Gorgeous card! Love how bright and cheery it is! What a cute little shaker card, I love it. Thank you so much for sharing. So. Dang. Cute. I love it!!! Wow! Your coloring is always so wonderful! That balloon is amazing.. what a cute card- these guys are going to have a fun time! Love the card. Those little bees make me happy. Not only is your card super cute, your blog is well written! Listing your supplies including your Copic markers encourages artists to increase their coloring skills. Way to go! Such a cute card! So festive. Nicely done! Amazing coloring!!! Love your card! Fun, colorful card. I love that Happy Birthday die. Such a cute and sweet card! Love the adorable bees. Awesome shaker card! Loving of the great cards so far! Love this shaker card! The bees are super cute. These bees are darling! Great coloring and card design! What a sweet card, your coloring is wonderful, very nice! Super cute bees ! Who wouldn't love to receive this card. Your shaker card is amazing! I love the scene you created and your coloring is perfect! It's so pretty! Adorable card! Love the cute bees and the pretty sentiment! Fabulous coloring! Very cute shaker--love the colors. Such an adorable shaker card! Love the colors. I've never seen this kind of shaker card! Thanks for listing the products you used at the bottom. :) Such a great use of the stamp set! Such a sweet card. Wonderful new release from Pink and Main. Fabulous shaker card! Your coloring (and shading) is amazing on those adorable bees, and you've created such a cute scene with them. What a fun and colorful card!! Your coloring is awesome!! Such a creative scene. Thank you for sharing. Beautiful coloring and great shaker card - so fun! Your card is so adorable and sweet. And making it a shaker card is a plus. Wonderful job. Thanks for sharing your creativity! I absolutely love the fun scene and cute bees!! SUPER adorable! PAR-T TIME! HOW FUN THIS CARD IS! Oh what a fun and adorable card! Cute scene and beautiful coloring. The bees are having so much fun. How cool, love this bright and fun card. I love your card! The bees look like they are having the best time! So pretty! Thank you for sharing! Absolutely love your coloring, it sure seems like the birthday party with those bees anD the shaker elements to add the bling. Great inspiration! Oh my, this is so creative and adorable. Love all the sequins at the bottom. This shaker is just so sweet, Thanks for sharing this inspiration with these fun products. It's a Bunny Baby vault release! Hats off, you did it!